It is important when out rambling, hiking or walking that your equipment is sturdy and reliable, able to take you the distance... and that should absolutely include your choice of socks. To that end, our men's Storm Bloc with BlueGuard Ankle High Walking Socks are a fantastic choice for all your outdoor adventures. Particularly on long trails, your socks need to defend against extremes of warmth or cold, the instability and impact caused by rough terrain AND be thoroughly reliable. 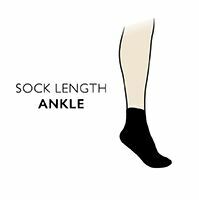 Storm Bloc with BlueGuard Ankle High Walking Socks have been designed and engineered to be the most durable walking socks possible, guaranteed not to develop holes. The anti-abrasive BlueGuard yarn combines with cotton rich blended fibre yarn for soft, yet strong socks with protective terry loop cushioning, extended heels, reinforced toe seams and woven arch support panels. Twin packed Storm Bloc with BlueGuard Ankle High Walking Socks are perfect for a range of outdoor pursuits, and every pair carries a lifetime guarantee.